FIGURE 2: Model for NSP1-CRL3 assembly. Following expression in the infected cell, rotavirus NSP1 interacts with the constitutively-active kinase CKII, resulting in phosphorylation of NSP1 C-terminal IκB-like degron. The affinity of β-TrCP for the phosphorylated degron, leads to the formation of an NSP1-β-TrCP-CKII complex. 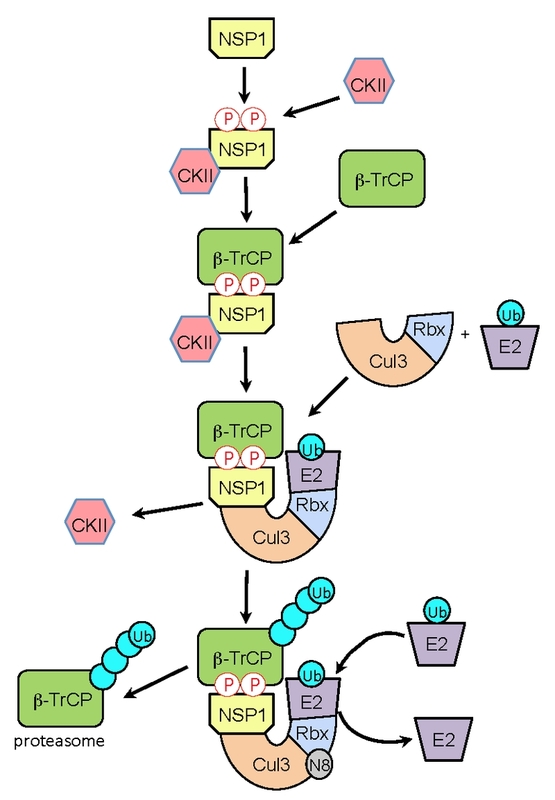 CKII is released as the NSP1-β-TrCP complex interacts with Cul3-Rbx1 to form an NSP1-CRL3. Recruitment of a ubiquitin-charged E2 enzyme to the CRL, followed by neddylation (N8) of the cullin component, facilitates ubiquitination of the β-TrCP target. Successive rounds of ubiquitination generate a polyubiquitin chain that signals proteasomal degradation of β-TrCP.